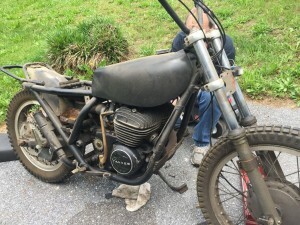 No, Yankee did not build an MX model – but I am! I am modeling from the prototype – yellow tank and side covers, white fenders, no lights (of course), and a low right-side exhaust system that “Yankee Bob” Fornwalt got me. In fact, the bike came from Bob. We picked one out of his collection that did not have any of the original parts which this project did not require, such as lighting, fenders, speedo, handlebars, rear shocks, etc. I also decided to powder coat the frame in white, and the alloy wheel hubs in black – a bit of an art project! Wheels are done, cylinders are out for exhaust thread repair, Bob is working on a clutch assembly and we are hoping to put the bike together in late spring of 2018. Need to figure out a front brake stay for the Husky conical hub… Stay tuned – it’s gonna be a looker!